This is a great brace for support while working and riding. This is a mini brace and is ideal for riders who need support through their back, but don't require a full Back Brace. 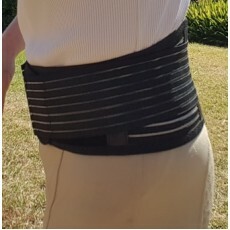 This brace is only 14.5 cm wide at the rear segment compared to 21 cm wide for the Lumbar Back Brace. If you suffer strong pain or are prone to your back "going out" then I would suggest the Lumbar Back Brace.